When you're managing multiple projects, you can't be on every job site every step of the way. Ensure that the job gets done according to your expectations by effectively communicating project details to everyone involved. 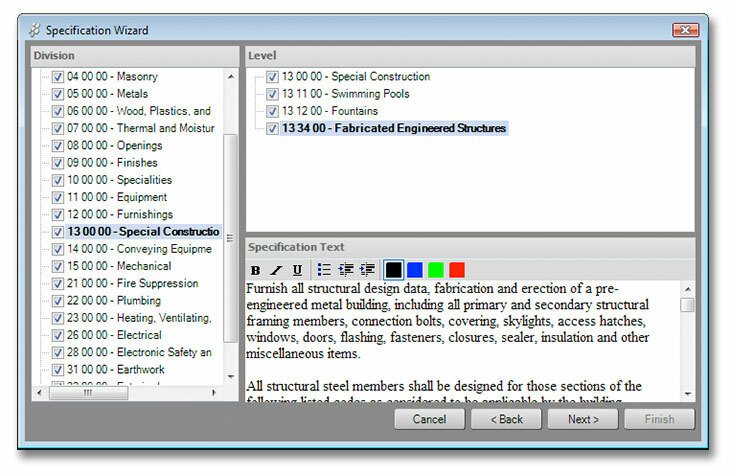 With ConstructionSuite, you can launch the Specifications Wizard to easily navigate, select, and edit 70-100 pages of detailed specifications and quickly create comprehensive spec books that cover the entire scope of your project. And in the new version, you can now save your selections in the wizard, so rethinking and retyping the same information is no longer necessary. Start with templates for Commercial, Residential or Property Development and customize to fit your project needs. 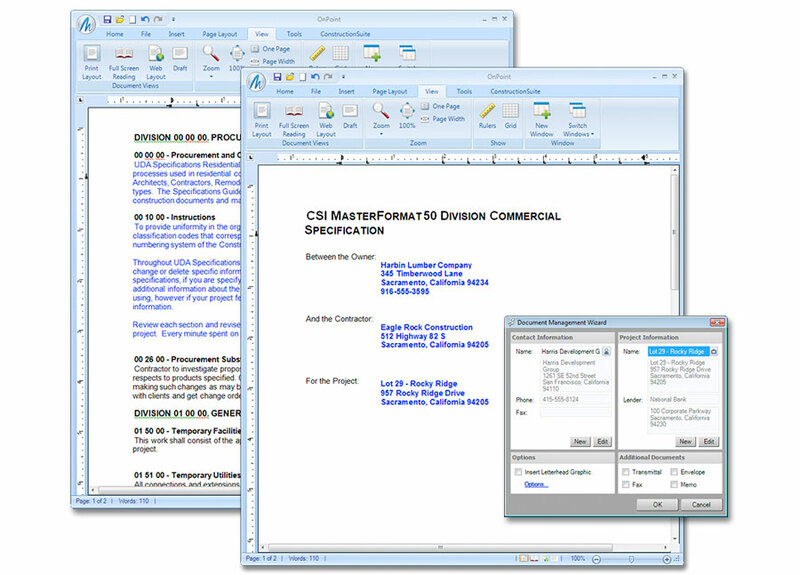 Preview, edit, and select specifications with the easy-to-use Specifications Wizard. Create wizard templates to reuse specification sets for each project type. Choose between the CSI MasterFormat 95 with 16 Divisions or the new CSI MasterFormat 2004 with 48 Divisions to produce detailed specifications for each of your projects. Authored by seasoned construction professionals, UDA Specifications provides detailed definitions of construction methods, materials and finishes that should be included with every construction contract to fully define the scope of your agreement and reduce misunderstandings between contractors, owners, buyers and building officials. Packed with over 300 categories based on the CSI MasterFormat, UDA Construction Specifications make it easy to ensure clear communication with your customers, suppliers, and subcontractors. Impress Clients. Win More Bids. Beyond the inherent benefits of detailing project specs for your vendors and subs, UDA Specifications can also be used to attract new customers. Choosing and hiring a contractor or remodeler can be an overwhelming task for a client, but you can build confidence and win more bids by including detailed specifications in your proposal package. UDA Specifications ties in with the advanced Document Management system and enables you to assign projects and contacts to your spec books - keeping your project information organized. Plus, you can use UDA Specifications in conjunction with UDA Estimating, Scheduling, and the automated Proposal to compile impressive bid packages that cover the entire scope of the project and avoid costly oversights or disruptive miscommunications. 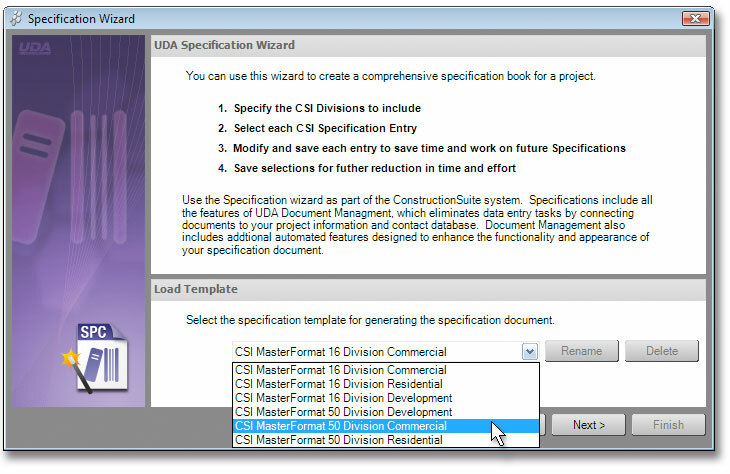 UDA Specifications is included in all versions of ConstructionSuite. Commercial and Residential Specifications are included in ALL ConstructionSuite versions. Specifications for Property Development are only available in Developer and Enterprise editions of ConstructionSuite CM.